The Voiis Mini is a peculiar beast that appears unsure what it's meant to be. Unheralded Japanese company Axes has just launched one of the most peculiar devices we've seen in some time - a portable audio player with neither music storage of its own nor a slot for a memory card. Instead, the Voiis Mini relies on Bluetooth to receive audio streaming from a PC for playback through its headphones. 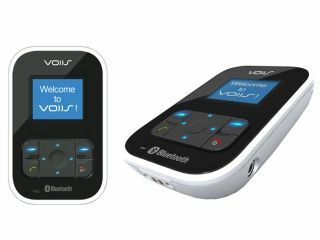 To make things practical, the Voiis comes with an adapter that uses Bluetooth 2.0, Class 1, to extend the distance a PC can sling data to 100m. At ¥15,800 (£65), it's hard to see who's likely to buy this, but that hasn't stopped Axes cramming it with features. As it picks up the audio streaming from a computer, format is irrelevant, so Windows Media Player, iTunes or anything else can be used (in theory). The oddest selling point, however, has to be the notion that anyone would want to use the Voiis for, well, voice calls. Axes reckons it can handle audio calls via Skype, MSN, AIM and more - that's why it has green and red call buttons. On top of that it can also display incoming text chats from an IM client on its 1.2-inch colour screen, although the lack of keyboard makes things a bit one-sided. The small amount of onboard memory that there is can hold up to 500 contacts, so perhaps a return voice call is the answer. Lastly, the Voiis charges by USB and will run for 6 hours with the Bluetooth active or 72 hours in standby. It's available next month, but only in Japan.